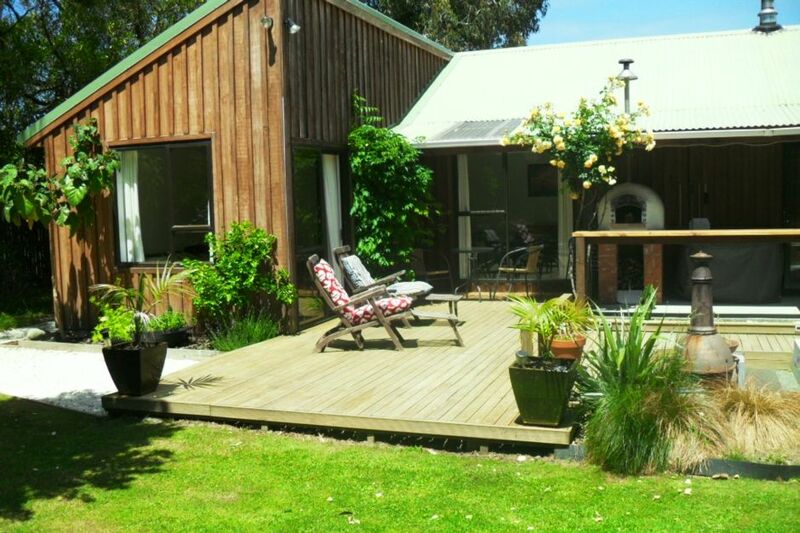 This warm, tranquil, modern, three bedroom holiday home, with log fire is situated at Peketa, a small settlement 12 kilometres south of the Kaikoura township, opposite the excellent surfing beach at Kahutara. Open the large bifolding doors to a superb deck and outdoor entertainment area in a large private garden, fully fenced and safe for children. Surrounded by native trees where native birds, including the bellbird, abound. Also a sleepout in the garden where older children can stay with two bunks and a small deck, hammock and swing. There are plenty of activities nearby including a Lavender farm, horse trekking, bird watching, bush and beach walks, star watching, restaurants, vineyard, golf course, surf casting, fishing, snorkelling, diving and swimming. The Mount Lyford Ski field is one hours drive and of course there is the whale watching, swimming with the dolphins, and seals. During winter months seal pups can be seen at the Ohau waterfall pool. Minimum stay during the week one night, weekends two nights. The house has a new modern kitchen with microwave, TV, video, telephone, CD Player, washing machine, iron, gas BBQ and fridge/freezer. Plenty of street parking for boats and room for tents in the sheltered garden. Very homely place to stay. Peaceful. Easy to book. No problems. The owner was very helpful. Beautiful cottage with everything you need and a wonderful backyard to soak up the sunshine. Would be wonderful if you had young children with you. Lovely private position and Carol is a fantastic host who couldn’t have been easier to deal with. Thank you for sharing your home with me. I will definitely be back and highly recommend it to others. Was sad to leave! We loved our time in this bach. The outdoor living space was excellent. It would be a great place if booking for a larger group. Thanks for everything! Good size, well-kept house, big garden ideal for a family. Large bedrooms and living area. The beach although across the main road was difficult to get to. There was quite a lot of road noise. The outdoor fire was very nice in the evening. we loved the break. we spent most of the time outside by the firepit. Enjoyed using the BBQ.It Was lovely seeing all the fantails flying around. Was great to see all the road works done on the way up. Great entainment area which we used all the time.